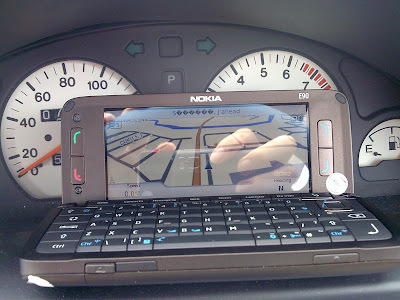 This is the NOKIA E90 with Garmin Mobile XT (cracked) switched on. The map is okay but the name of the road and other landmark always shown in a word starting with an alphabet and followed with "?" that should be alphabet too. This made me unable to search for the correct place that I want to go as the name of the place always become short formed. Is this because I haven't really crack* the software? Or there is some problem with the map? Looking forward to hear from anyone who manage to use GPS to navigate without this problem. Just change a map that is unlocked/ not locked then the road name will be displayed correctly.